After the chaos of leaving Macau we arrived at our hotel in Phnom Penh at around 9am having had little to no sleep. 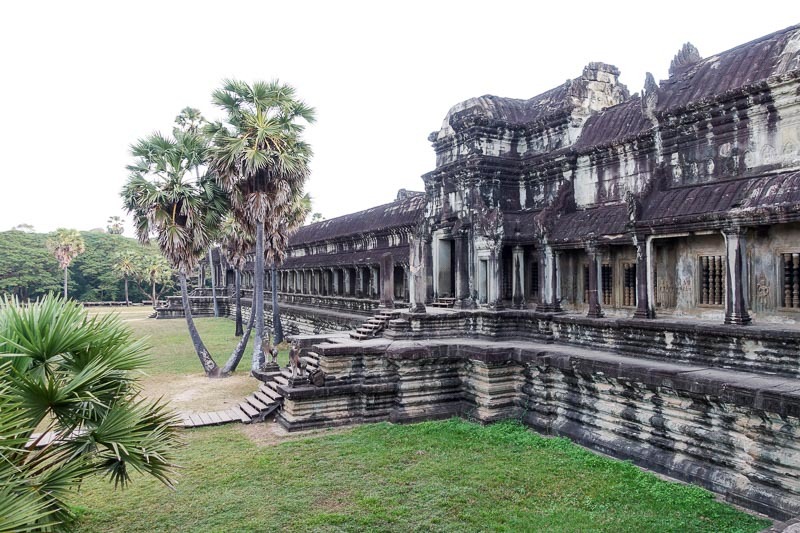 As we booked our accomodation here while at the airport yesterday, we decided to spend six days in Phnom Penh. This was only the second time in our whole trip we had spent this much time in the same place, but after so many 2-3 night stays over the last month or two we were looking forward to not packing again for a few days. We had to wait a little until our room was ready, and while we waited we were given these drinks below. In my dazed state I didn’t ask what it was, but it tasted good. Would love to hear what it is if anyone knows! 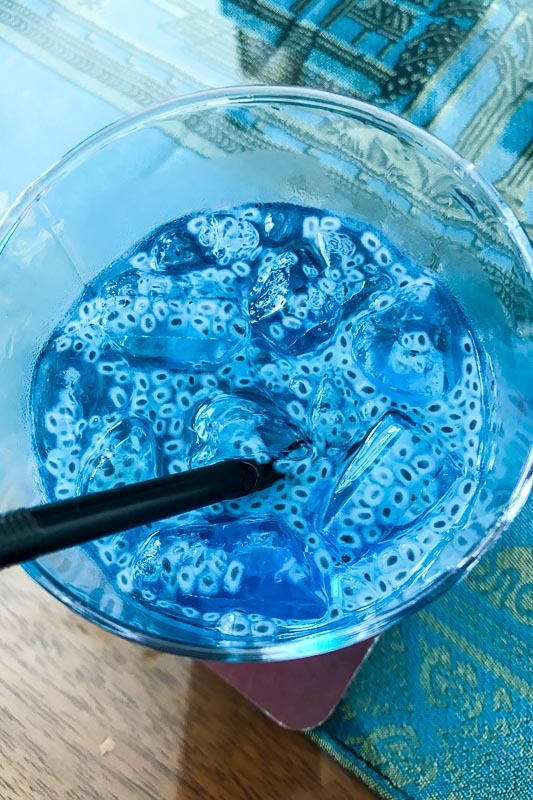 Any idea what this blue drink with seeds is? Not surprisingly, once we got into our room we slept all day. We ate at the hotel and slept some more. 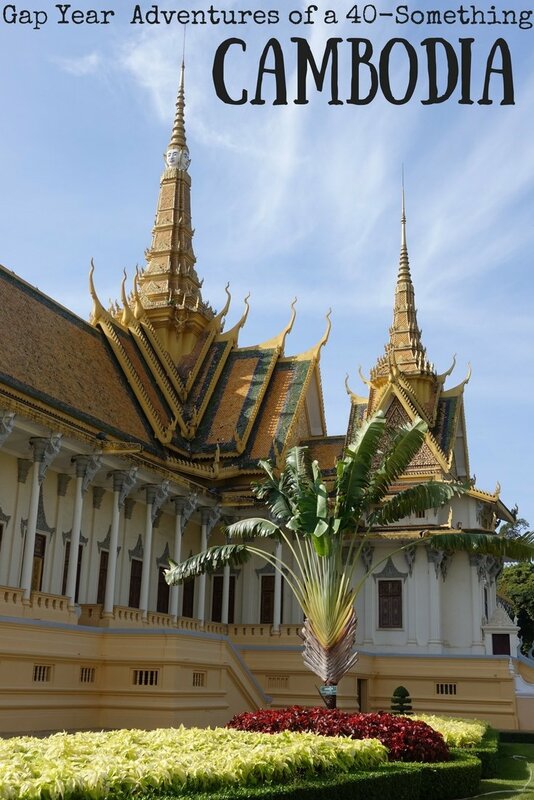 We were in Phnom Penh for more than 24 hours before we even got out the door to have a look around. I have to admit, for the whole time we were there we took it fairly easy. We were back in the heat, with temperatures in the low to mid thirties, so we got back into our routine of going out in the morning for a few hours then retreating to the hotel pool or air-conditioner in the afternoon before going out again for dinner. 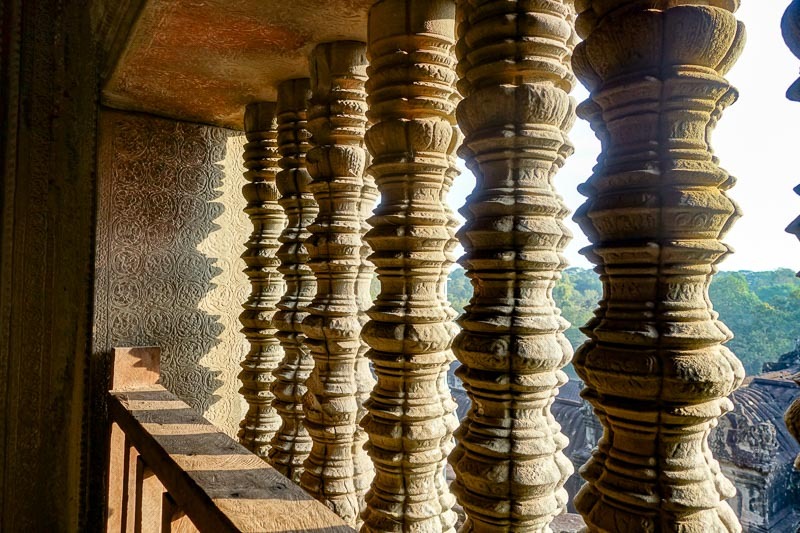 One morning we walked around the Royal Palace area including the riverfront, getting our bearings and marvelling at our first glimpses of the Indo-Chinese architecture. The swirly bits on the rooftops (I’m sure they have a proper name, but I don’t know it), the lions, dragons and snakes, all covered in as much gold as possible caught our eye in every direction. 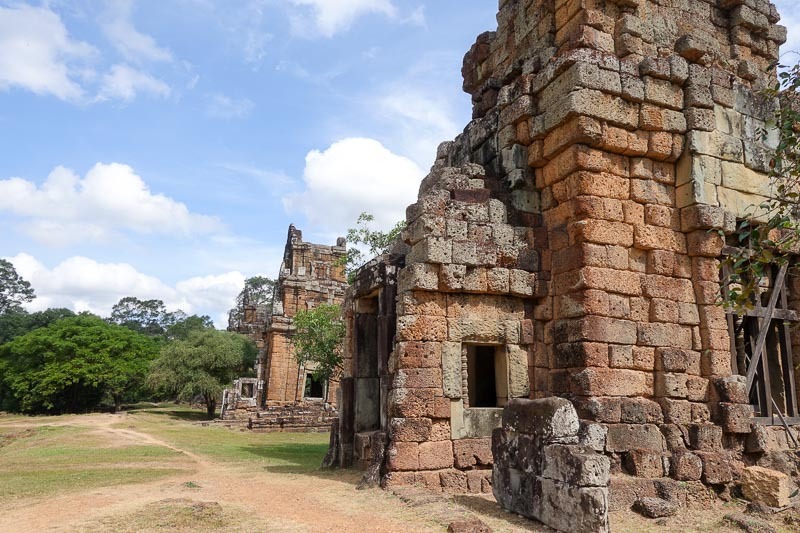 We enjoyed the buzz of the city, and even though we had never been to Cambodia before, there was that South East Asia familiarity. There is no where else in the world that has that lingering smell of durian! We stopped in a couple of places on our walk that first morning, first for drinks then for lunch. There is an abundance of places along the riverfront offering all kinds of food. You will be lured in by the ever-cheaper beer prices. We saw beer for as little as $0.50 a glass! We also saw the less attractive side of the city. Even in the late morning, you can easily find bars with local girls sitting on stools out the front, like they are the ones for sale. In some ways this is not far from the truth. Usually they look bored, each staring into their mobile phone to pass the time. 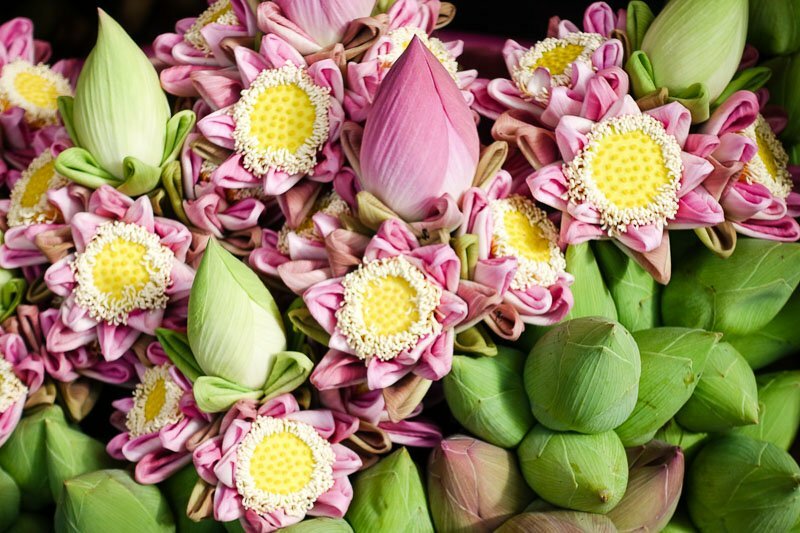 The beautiful lotus flowers were arranged with their petals tucked in as a temple offering. On one morning we decided to actually visiit the Royal Palace. With an entry fee of $13AUD/$10USD it’s a little on the pricey side for what you get. Really it’s just a few buildings – although quite nice looking ones at that! 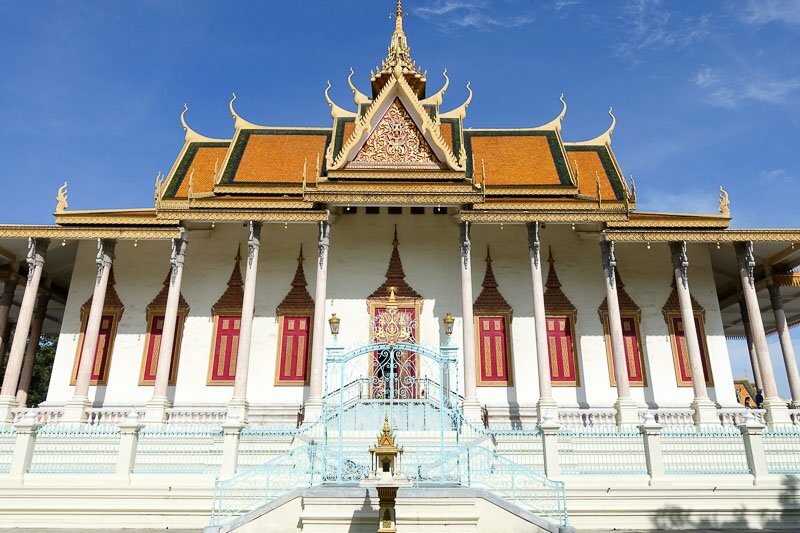 While the King does still live here, the private section of the palace is off limits. There are a few small displays, and I was a little disappointed that there wasn’t more information about the royal family. It seemed most of what was there was geared towards locals who knew all the basic information. 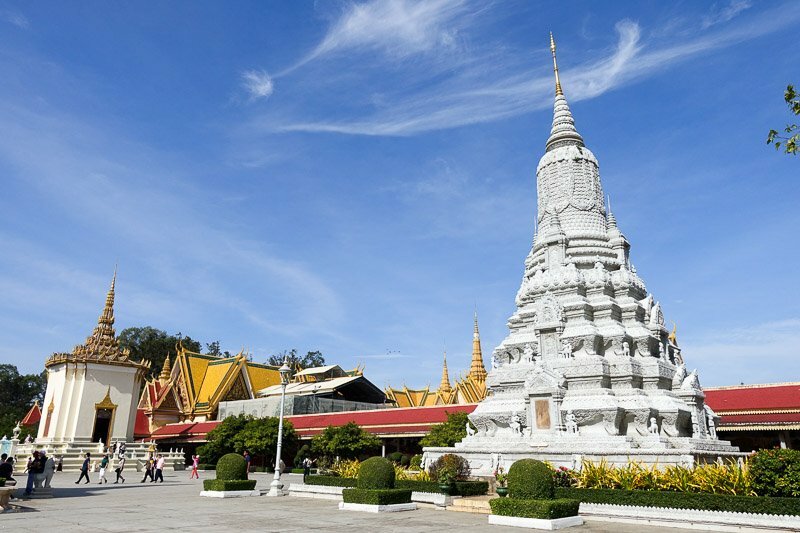 Included in the entry fee is the Silver Pagoda. We almost missed this entirely. We were about to walk out with a feeling of “Really? Is this all that’s here?” when I had a quick look at the map and noticed a whole other section. There were some lovely pagodas, the first of thousands we were to see over the coming months. Another walk along the riverfront (with a coffee stop on the way) saw us at Wat Phnom. 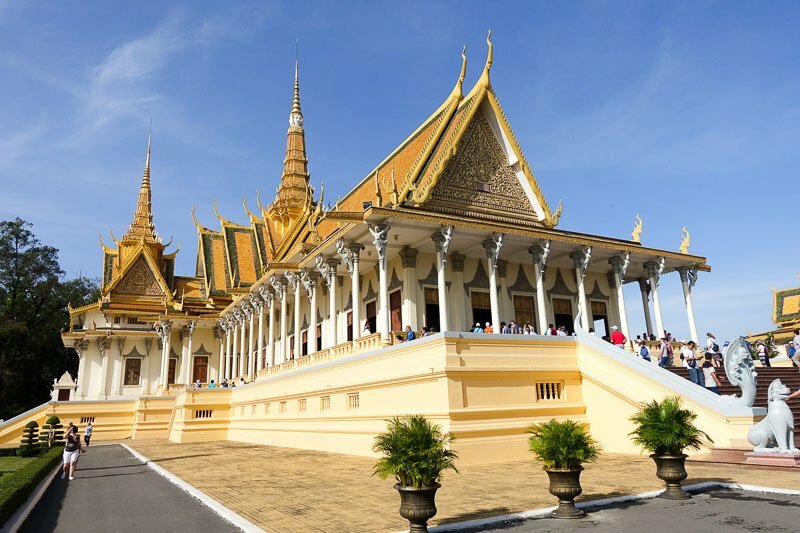 This budhist temple is right in the centre of Phnom Penh, and the tallest religious structure in the city. 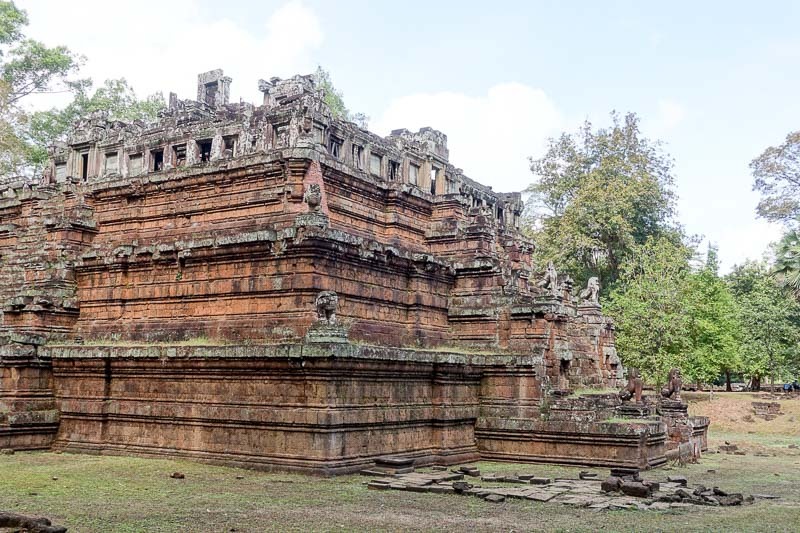 It was originally built by a wealthy widow called Penh (or at least she paid for it) back in the 1300s. It has of course been renovated many times over the years. We paid the $2USD to enter the temple and have a look inside, which is probably not really worth it. The most impressive bit is the overall view of the temple, particularly when it is all lit up at night. 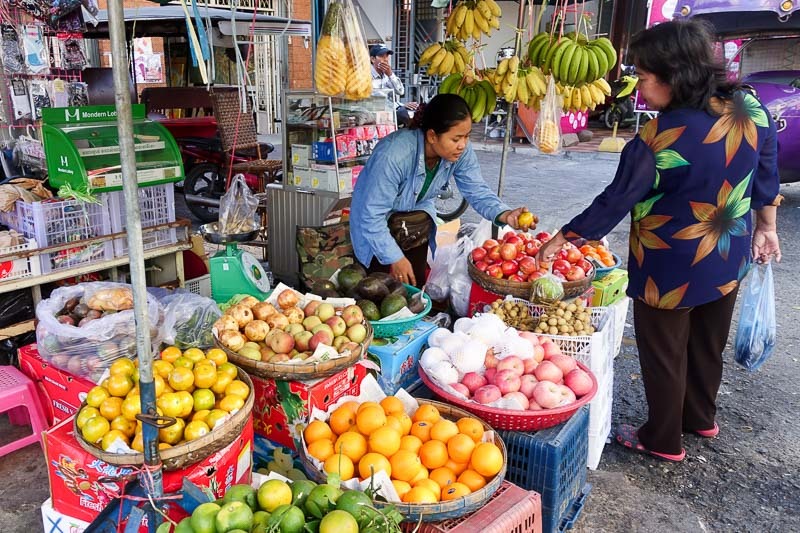 One our way back from Wat Phnom we walked through the Central Markets. This place is huge, and has everything you can possibly imagine. The food section was crammed with people selling all sorts of delicious offerings. If we had known, we would not have eaten only minutes before. There was a mix of locals and tourists downing seafood and noodles and things on sticks. 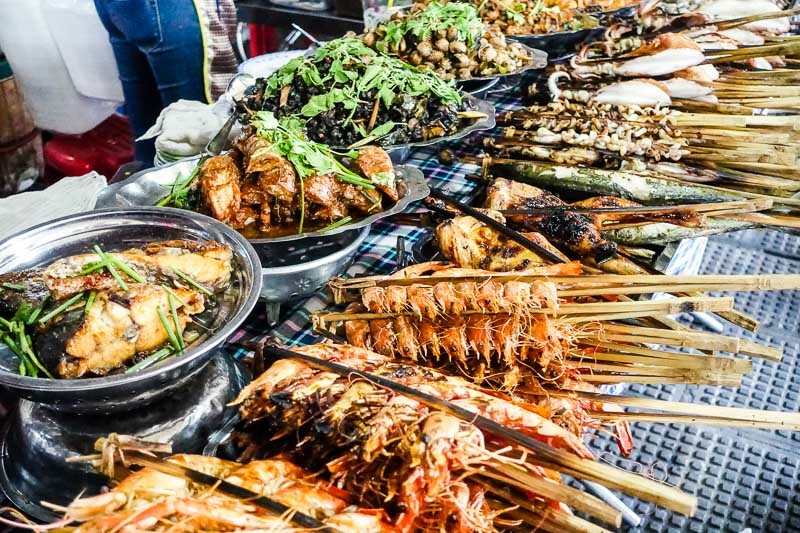 There were sizzling woks and clashing of tools, vendors yelling and the neverending stream of motorbike horns. South East Asia at its best! I loved it! 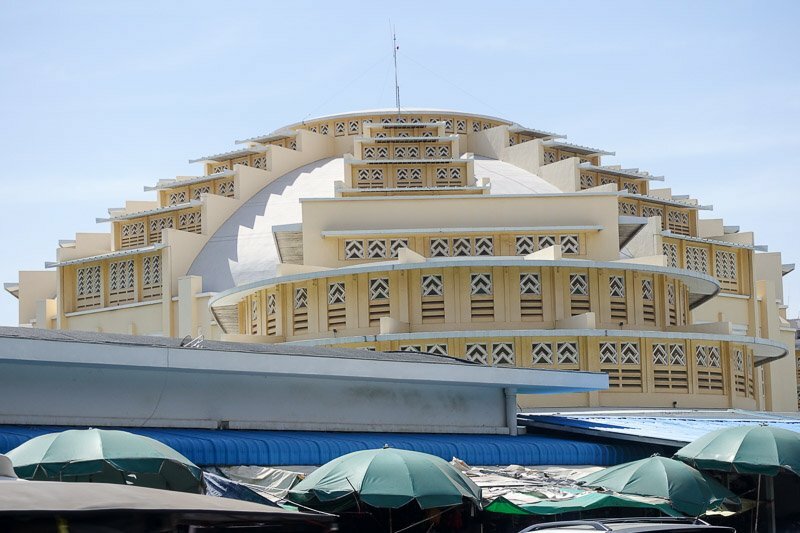 The domed Central Market building is completely surrounded by extra market stalls, spilling out almost to the street. 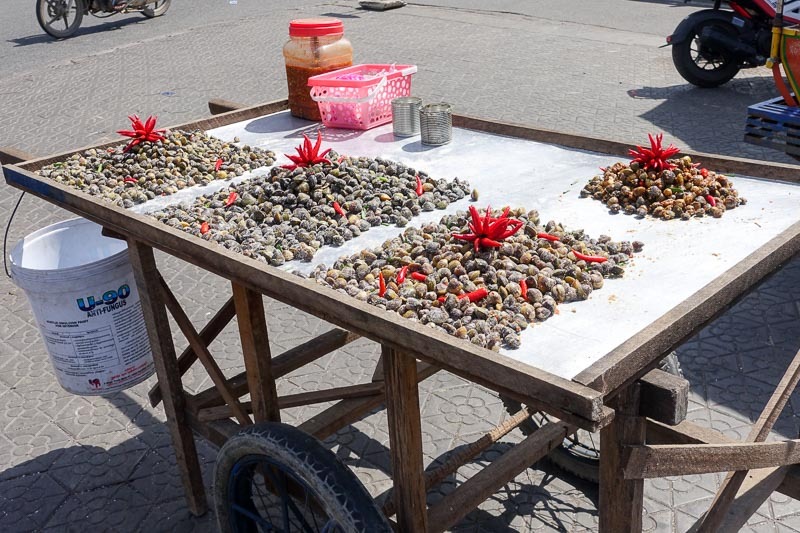 The colourful carts of shellfish were out in the sun all over the city. 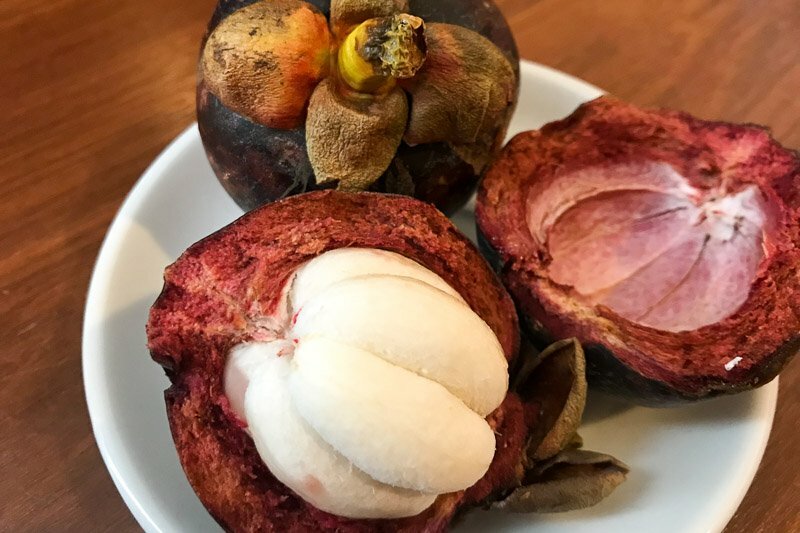 I was even more excited when I came across my favourite – mangosteens! This amazing fruit was not yet in season, but in the markets here I was able to buy a some from who knows where. I probably paid way too much, but I was so eager to have these I snaffled them up! That was my snack foods bought for the net few days. 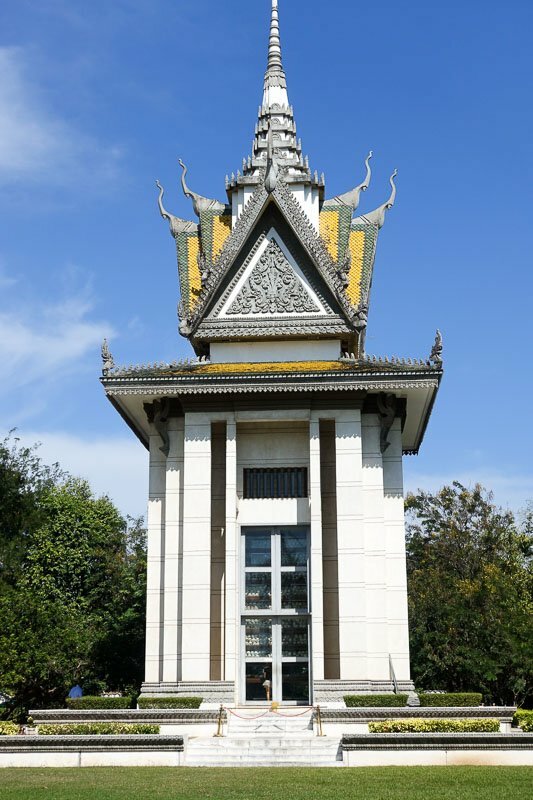 Everyone who goes to Phnom Penh surely must visit the Killing Fields to learn about this atrocious part of Cambodia’s history, an event that affects almost every local person in some respect today. 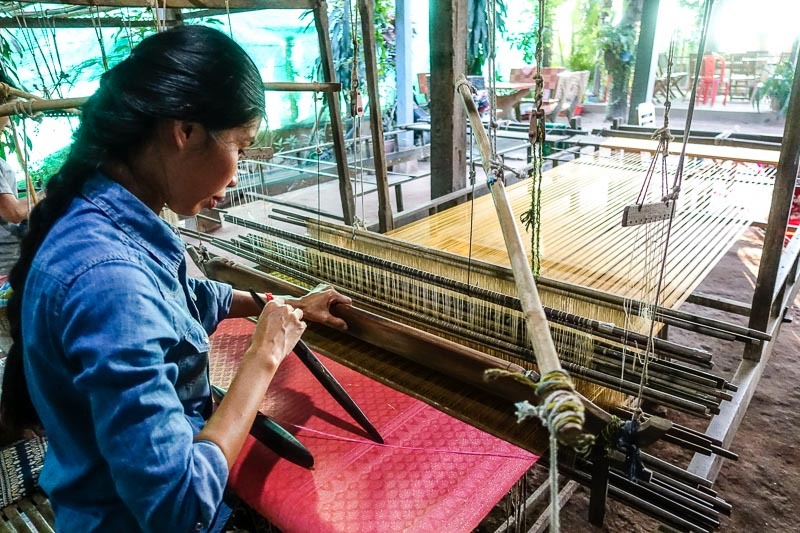 We decided to book a day tour with Urban Adventures, combining the Killing Fields and the S21 Prison with an afternoon on the other side of the Mekong learning about silk making and weaving and visiting a monastery. Our day started with the Killing Fields. It was about an hour of driving from the centre of Phnom Penh before we reached the site. I was surprised at how small it is, but that just makes the amount of deaths that happened in this area even worse. There is not a whole lot to see now, but lumpy grassed areas where many of the mass graves have been excavated. 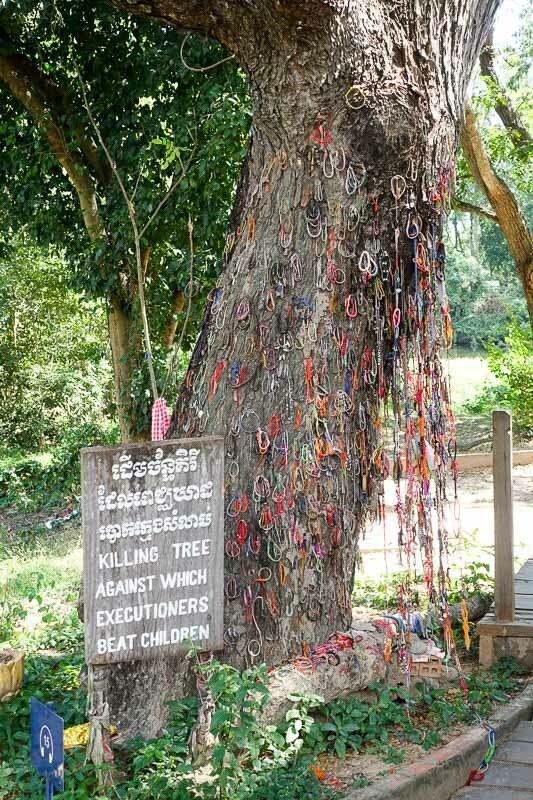 Some of the horrors come alive with simple signs pointing out the tree that was used to kill babies and a tiny area where hundreds of women and children were found naked. Don’t these grassy mounds look so benign? In the middle of the site a memorial has been built. This building houses seventeen layers, each one containing bones of the victims. Inside, at eye level, it is possible to see the way some of the victims were killed, with shattered skulls or severed vertebrae. At the end of our visit we saw a short film explaining what had happened. Our guide had explained it really well on the bus on the way, so mostly for us it was a repeat of information, but with visual reinforcement. The sombre feeling in the air as we left the room was palpable, with complete silence from even the selfie-stick wielding contingent. 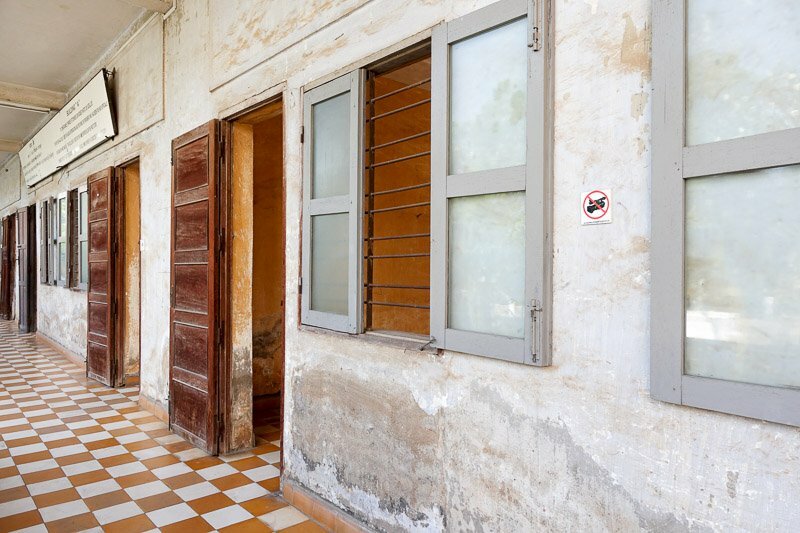 We made our way next to S21, now the Tuol Sleng Genocide Museum. 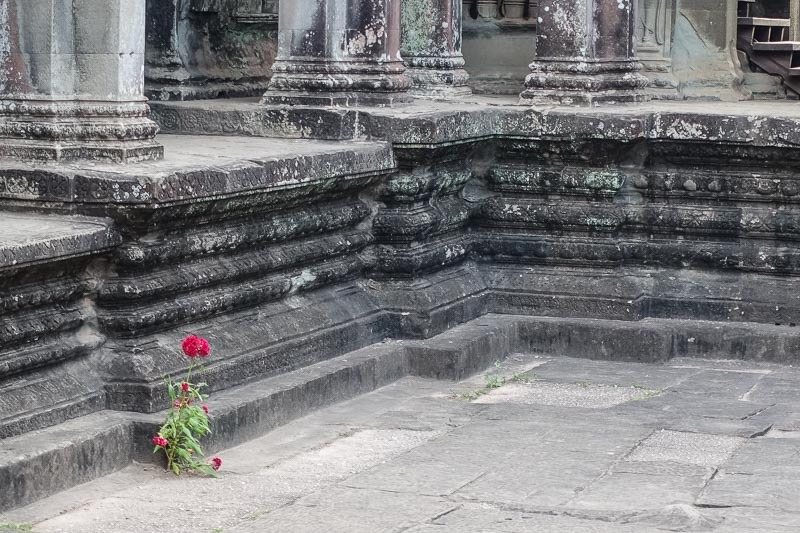 This was the place were people were taken when they were first “arrested” by the Khmer Rouge. Most people didn’t stay here long, they were soon escorted to the killing fields. 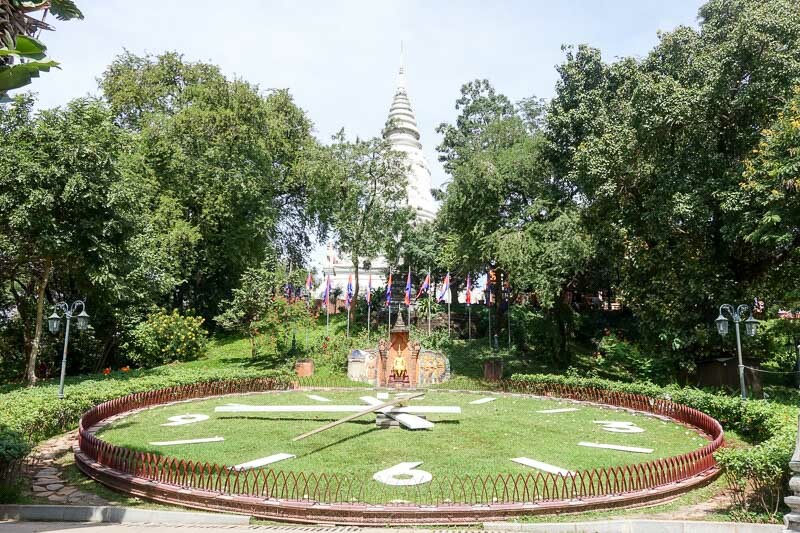 There were only seven known survivors of the prison, and at least 20000 people were sent from here to the Killing Fields. We were not allowed to take photographs inside of the buildings. They were filled with many pictures of the prisoners. Each one was photographed as they arrived. Some of the records were destroyed, but there are still enough to make an impression. The numbers are astounding. Some of the prisoners were Khmer soldiers. These photos were the most confronting of all. These soldiers looked like (and were) just children. Other rooms still showed the cells the prisoners were kept in. This was originally a high school, and makeshift brick walls had been put up to separate spaces about 1 metre wide by 1.5m long. There was no door. The single adornment to each cell was a metal loop mortared into the wall that each prisoner was chained to. Each of the survivors had given an account of his/her time in S21. One prisoner thought himself lucky to be hosed off once a month in place of a shower. Another was not bathed a single time in his three months there. We can’t even imagine what these people have gone through! S21 itself is not that confronting – it’s just benign buildings really – it’s what you can imagine happening that isn’t said. I thnk it’s important to visit to get that feeling that is present in so many places of atrocity. This just can’t happen again! Some of our group was only doing a half day tour, so we dropped them off then made our way to a litte local place for lunch, meeting another person for the afternoon tour. 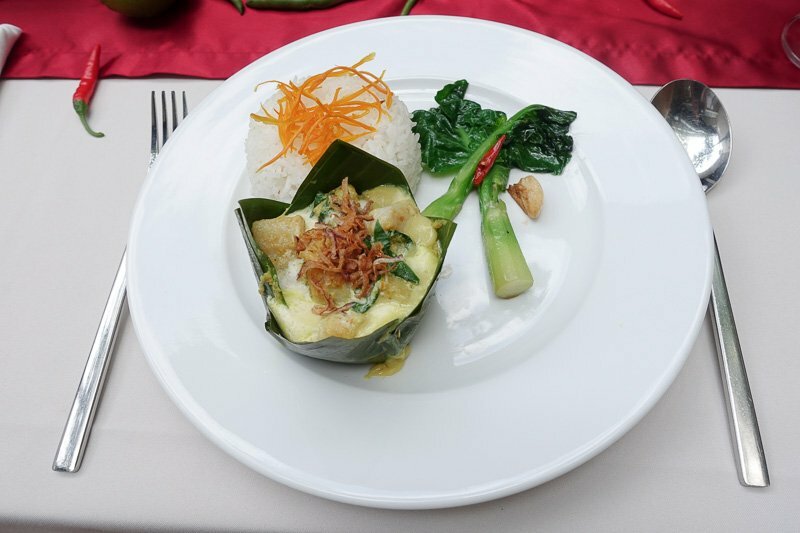 We tried a few local dishes including fish amok, which was fast becoming a favourite. We had waved goodbye to the bus, and the rest of our afternoon was to be spent travelling by tuk tuk and boat. I was becoming a huge fan of tuk tuks. They could weave through traffic and get you wherever you wanted to go faster than cars. We were also part of the crowd. 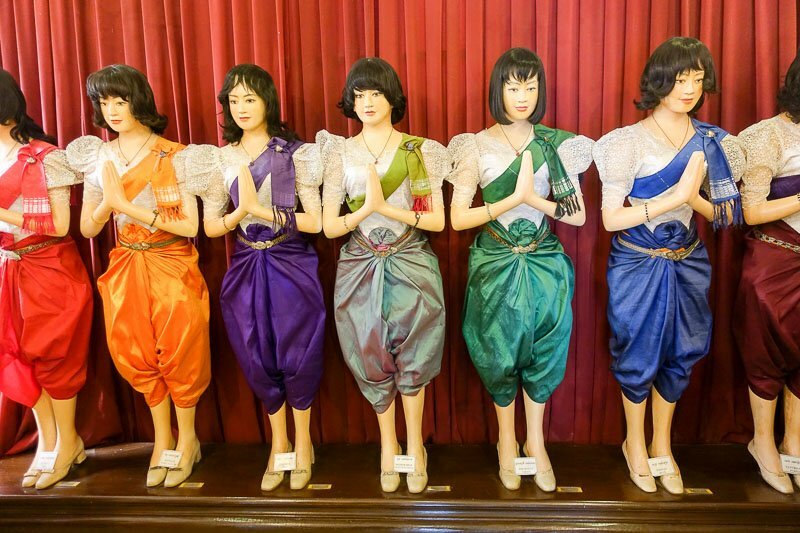 So often locals would call out “hello” to test out their english skills on the blonde lady! 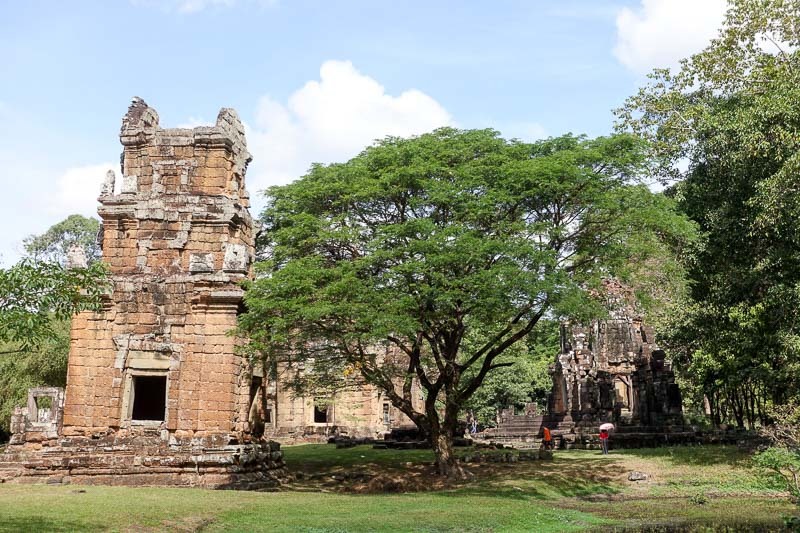 As we made our way towards the bridge over the Tonle Sap River we made a quick stop again at Wat Phnom so the others in our group could have a quick look from outside. We crossed the bridge and made our way toward the Mekong ferry stop. (Phnom Penh is built where the two rivers meet, so we had to cross both.) It was a car ferry – or in this case a motorbike, tuk tuk, tractor, bicycle and car ferry. There was no organisation as everyone just crammed on, so at the very last second as the ferry was moving away. We were sitting upstairs near the wheelhouse, and were surprised to see that the guy driving the ferry was little more than a teenager! Once across the Mekong there was a more rural feeling to the area rather than a big city. We stopped first at a Buddhist monastery to have a walk in the grounds and see how the monks lived. This gave our guide a chance to give us a very brief rundown on Buddhism, some of the beliefs, traditions and ceremonies. Our next stop was in a silk factory. 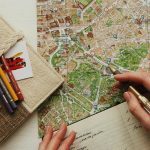 Over the years I have done hundreds of these types of stops during tours – the basic premise is to take you somewhere, show you the process and then encourage you to buy. While this visit was still that basic idea, I have to say it was one of the best. It was a family run business and literally run from outside their house only by the family members. One of the daughters spoke great English and talked us through the process from showing us the silk worms they breed to the final products. I was absolutely in awe of the weaving process. The way the girls have to use both hands and both feet simultaneously to move the various bits of the loom is incredible. I had a go at a very simple design with only about half the moving parts and I was clumsy and incredibly slow. It would have taken me weeks to create a scarf, and these girls do more intricate designs in hours. With each pass of the shuttle all those poles in front need to be in the right place to make the pattern. These girls change them with one hand while grabbing the shuttle and pushing it back through with the other. For the first time on this trip I bought myself a souvenir – a beautiful silk scarf. After seeing the work that goes into these I couldn’t help myself. 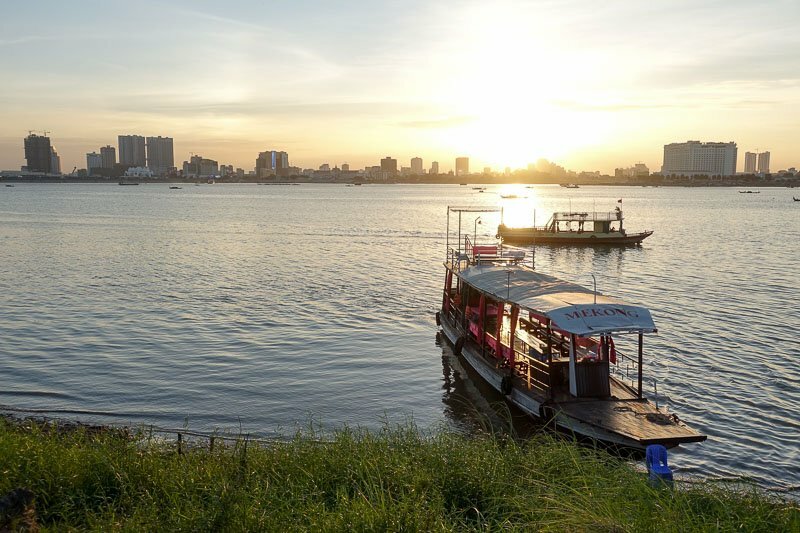 To get us back to Phnom Penh city centre we had a sunset boat cruise with snacks and drinks included. We again jumped in a tuk tuk for the final leg back to our hotel. It had been a long day – about 11 hours – but we saw a lot we would have missed had we just chosen to go to the Killing Fields and S21 by ourselves. We spent New Years Eve in Phnom Penh. We are not big party people at the best of times, but we did want to head out on New Years Eve. We found a local bar that had good music and stopped off there for a few drinks first. We decided to make our way down to the riverfront at about ten o’clock. I have never seen traffic like the streets in Phnom Penh that night! They were seriously jammed packed. Even intersections were blocked, with traffic lights completely ignored. Vehicles literally moved just inches at a time as they weaved though the crowd. As pedestrians we also struggled, because not even the footpaths were clear, they were also crammed with motorbikes trying to get somewhere. We walked for a while, but with the huge crowds ending up retreating back to our quiet(er) bar to see in 2018. Our second stop in Cambodia was Siem Reap, and we were treating ourselves with a stay at the Somadevi Residences. We really loved staying here, and ended up spending a lot of time in the hotel. We got a massage for the first time on our trip. I am not a huge massage fan – for no reason, I just haven’t had a lot of them over the years I guess. This one didn’t change that perception a whole lot. It was extremely painful for most of the massage, so not at all relaxing while it was happening, and the next day I woke up with slight muscle pain from it. It was probably good for me though! We also did a cooking class offered by the Somadevi. We got to go with the executive chef to the markets which I really enjoyed. He talked a lot about the fresh produe and what it is used for. I was able to ask all those “what is this” and “what is it for” questions I always have when walking through local food markets. 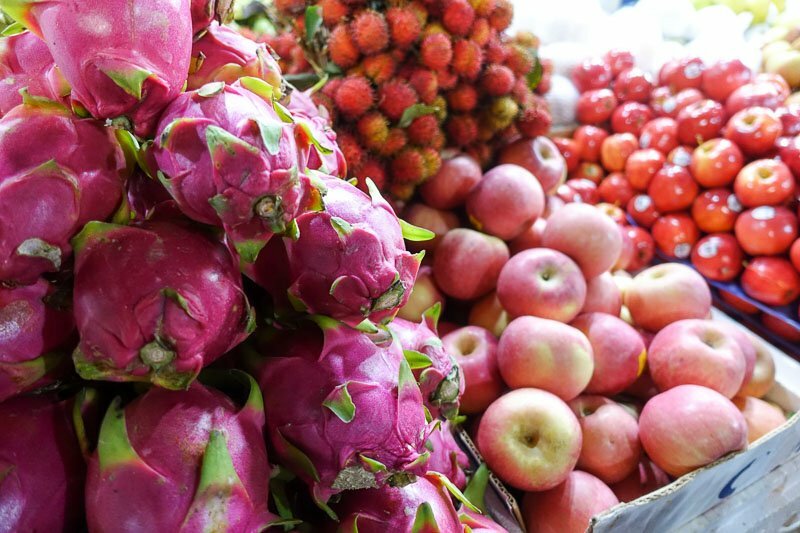 Dragonfruit, rambutans, apples – lovely red fruits! Back at the hotel we got to help prepare a four course traditional khmer menu. This was not a cooking class where we were lined up, given ingredients and told “chop this, stir that!”. One of my big failings in life is I cannot cook! I’ve tried, I am just hopeless at it. 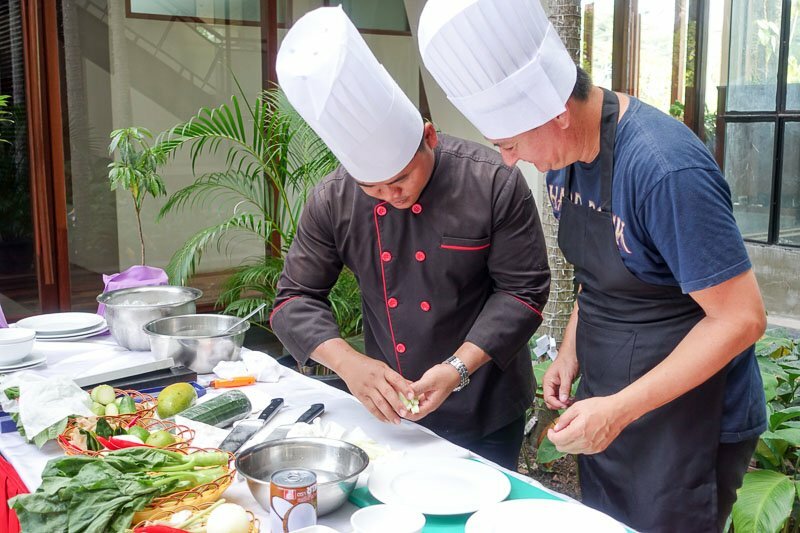 So this was the perfect cooking class for me – I didn’t touch a thing! Simon got a bit more involved, but I stood back and watched and learned. It was really interesting listened to why things are done the way they are. One of the dishes was the delicious fisk amok. 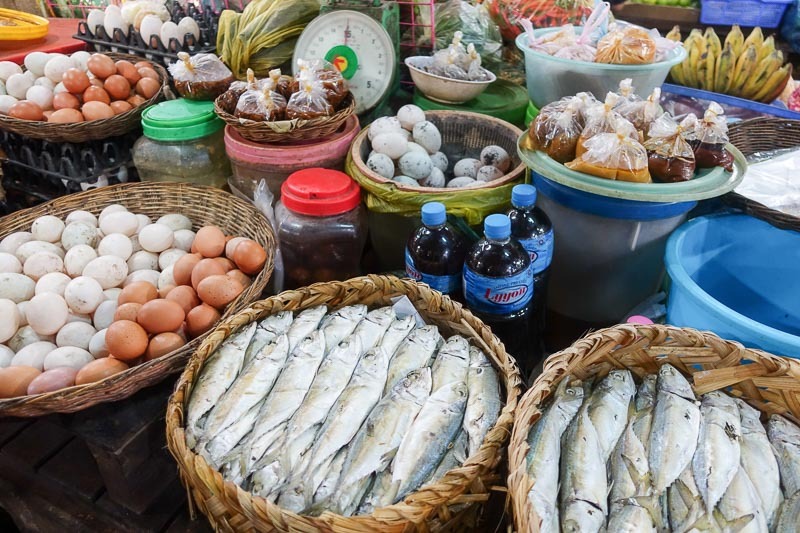 I had already eaten it a few times in Phnom Penh, so I was excited to learn how to cook it. Traditionally it cooks for hours, but we were shown how it could be cooked to create the same flavours but in less time. Lesson number one – how to chop vegetables! 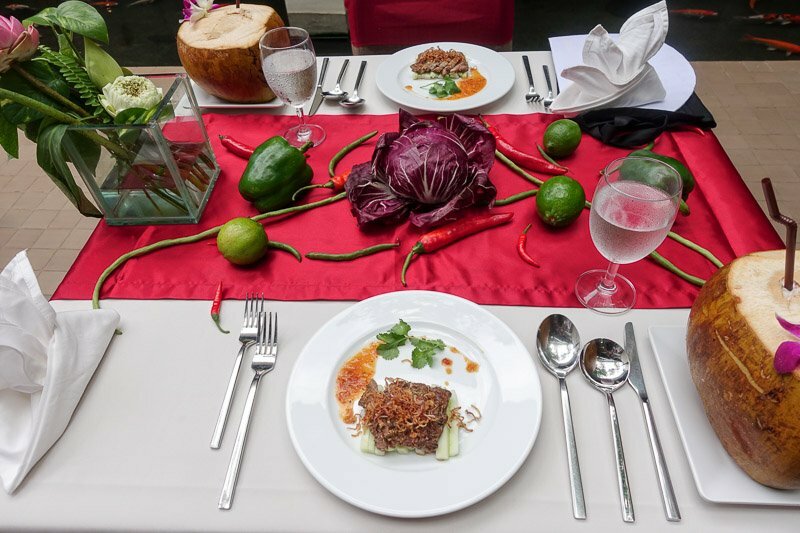 Look how beautiful that table is – with the starter ready to eat! All of the dishes we made were amazing, and we could participate as much or as little in the process as we liked. I cannot recommend this cooking class enough! 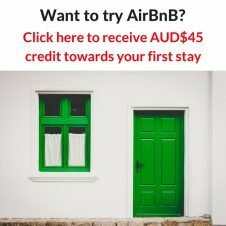 For $35USD it is not the cheapest class out there, but we more than got our money’s worth with the personalised attention and the information we received. You do not need to be staying at the Somadevi to do the cooking class. So we bought a 1 day ticket exactly at 5pm, and made our way straight to Angkor Wat to watch the sunset. The sunset is actually in the wrong direction, but this gave us about 45 minutes to explore the main Angkor Wat area, and because we lingered as long as we could (until we were told to leave by the security guards) we were able to get some photgraphs with no other people in them – no mean feat with the thousands of visitors there each day. Sunset at Angkor Wat may not have been dramatic the day we were there, but it did give us the opportunity for some relatively crowd free photos. Another angle of Angkor Wat taken as the security guards were waving us towards the exit. We were back again the next morning for sunrise. We had organised a tuk tuk for the day through our hotel for $25USD, which seemed to be a fairly standard price. 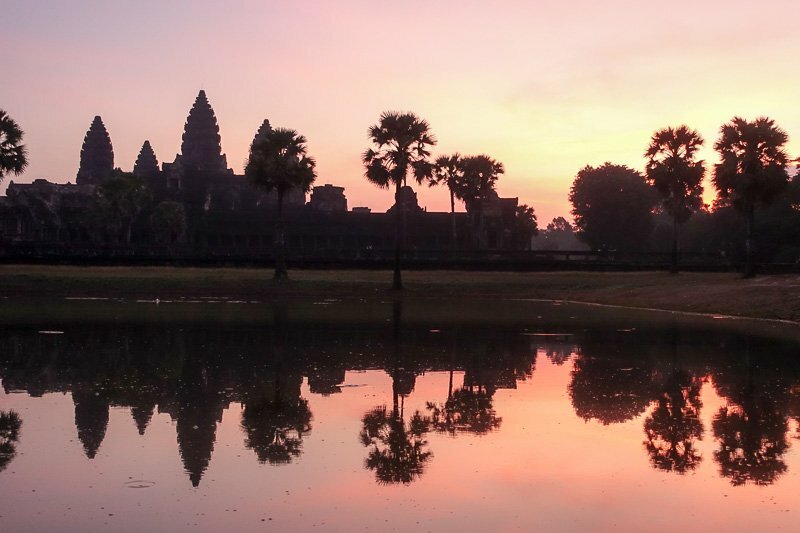 We were picked up at 5:30am which allowed us to get to Angkor Wat and get a good position for the sunrise. The crowds built up and the sun peaked out from behind the trees in the distance. It was lovely to see and I’m glad we did it, but we didn’t get one of those picture perfect sunrises you’ve seen on the internet. 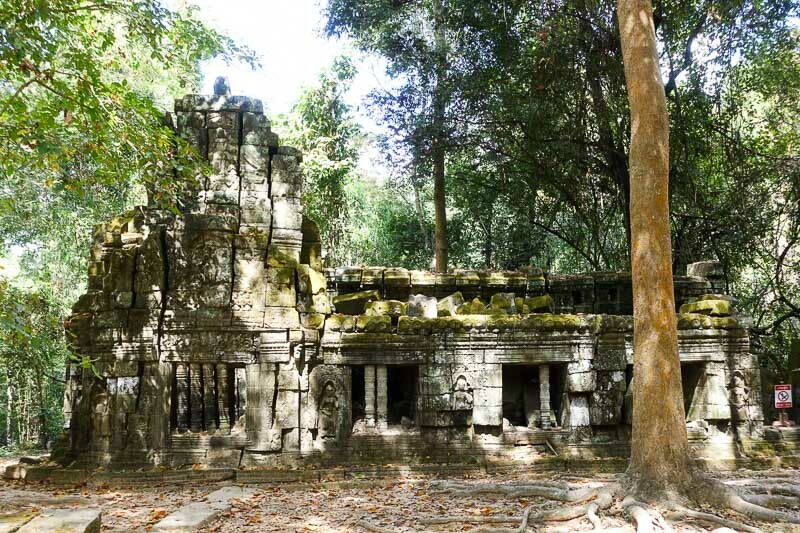 We spent the rest of the day exploring some of the many temples around the Angkor complex. It really is huge, with hundreds of temples, some big, some small, some renovated, some just a pile of stones. All of the popiular ones were crowded and it wasn’t until we ventured a little further afield that we had some areas to ourself. Here is a small selection of the hundreds of photos I took throughout the day. We were loving our time in Cambodia. It had been relaxing and everything went smoothly with no hiccups or stress – which of course meant we were due some. In the evening before our flight out of Cambodia, Simon went to print off our e-visa’s, to discover his had not yet been approved. We had done the application a few days earlier and mine had come through the next day and we just assumed that meant both were okay and hadn’t specifically checked Simon’s – whoops! Our flight was at 1pm, and finally, around 11am, the e-visa came through. Talk about cutting it fine. We had spent the whole morning coming up with contingency plans, and whichever way we looked at it it was going to be expensive. The hardest part was the exit flight. 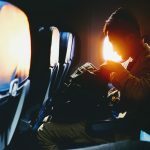 We had already had to book a flight out of a country while standing at the counter trying to check in for our flight into it, and didn’t want to go through that again. 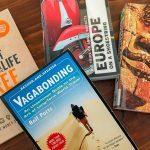 We had just enough time to print out the e-visa, book our exit flights and get to the airport – where this time we of course weren’t even asked for proof of exit! 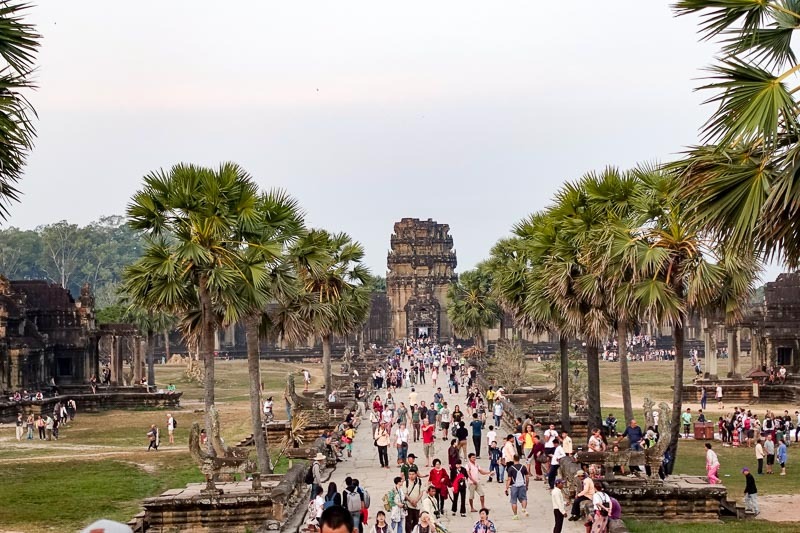 Cambodia is yet another country that we really liked. It was relaxed, easy to get around, cheap, and the people were warm and friendly. I would happily recommend it to anyone. 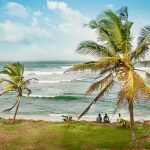 It is one of the cheapest countries we have been to. We could easily get a meal with alcoholic drinks for under $20AUD ($15USD) but mostly it was closer to $10AUD. We saw beer as low as $0.50AUD, and accommodation in hostels advertised on sogns out the front for as low as $3AUD per night. Wifi was patchy. We found some places were good, with fast internet, others not so good. 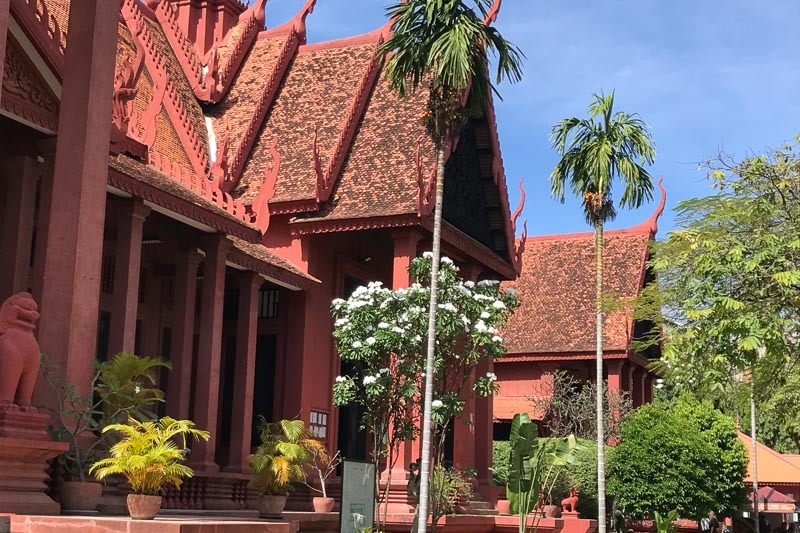 Most of the places we ate in Phnom Penh offered free wifi, but not in Siem Reap – unless we picked the only places that didn’t! 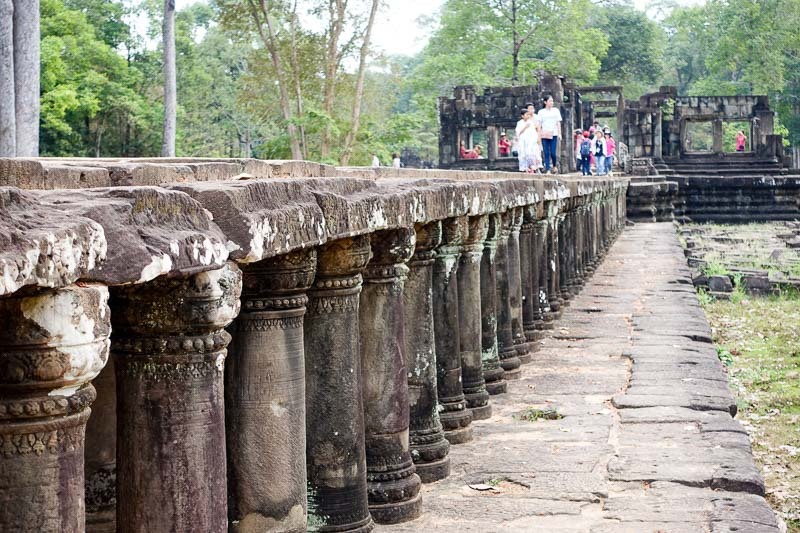 We did consider catching a bus from Phnom Penh to Siem Reap, but decided to check out the price of flights too. There was a flight for only $24USD ($32AUD) including our checked baggage, so we went with that instead. We booked only a couple of days befre the flight, so not sure if we got some super last minute deal, but when it is this cheap there was no reason to spend hours on a bus. Getting around in the cities was cheap and easy by tuk tuk. Remember to bargain, but not too hard. what ends up being a dollar for us means a lot more to the locals. 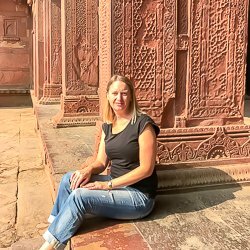 I really enjoyed this article Josie with ots of good information specially about your tour of The Killings Fields and the cooking class. 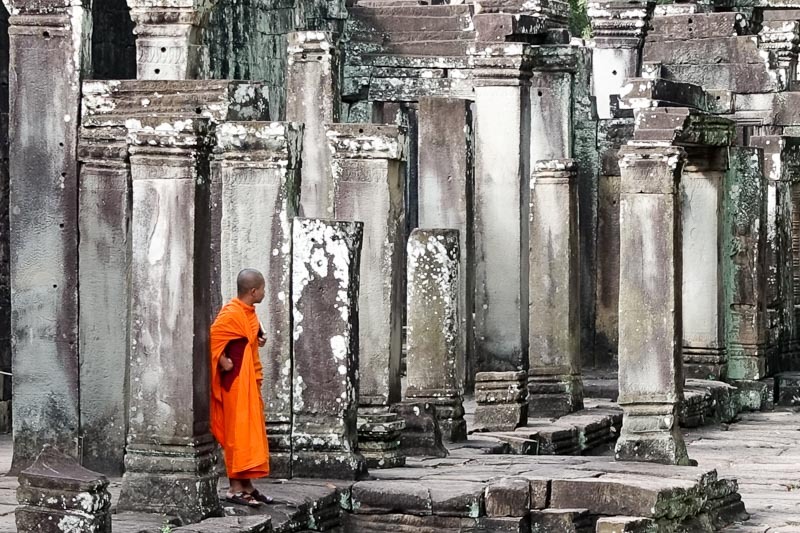 Great amazing people-free photos at Angkor Wat too. Thanks Megan. 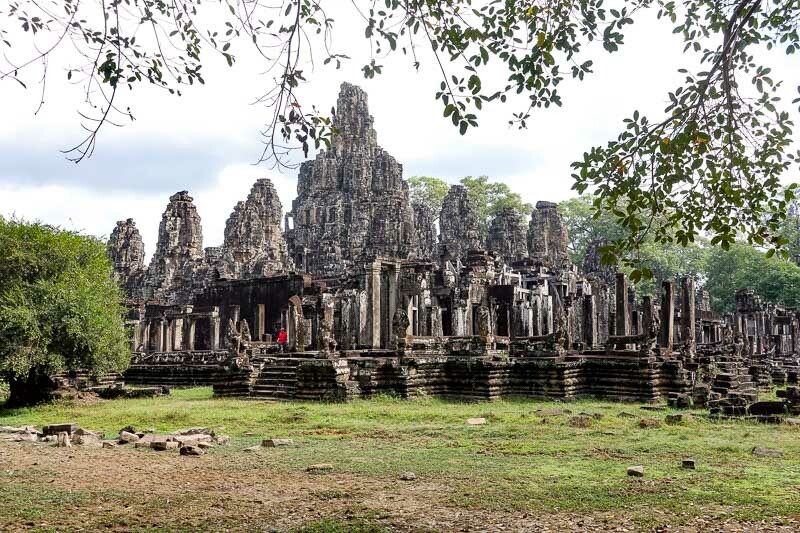 Cambodia is one of those places I will recommend to everyone, we really enjoyed it. This post brought back so many memories for me. 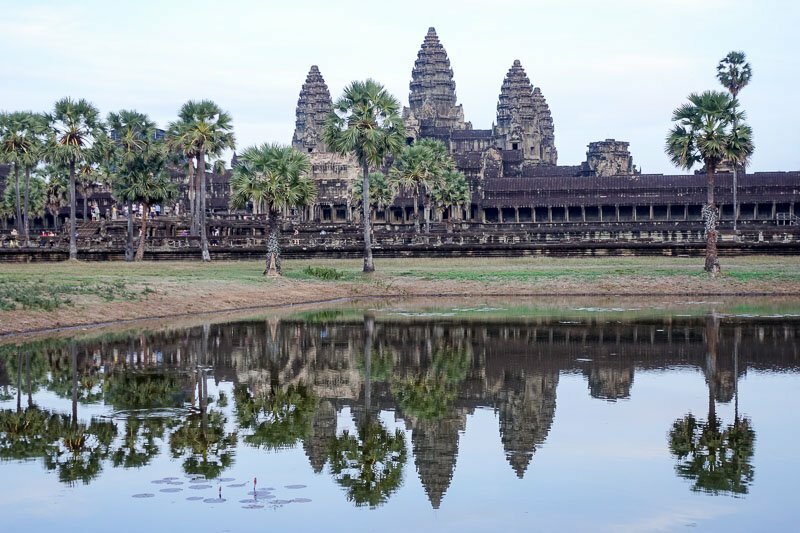 I loved our visit to Phnom Penh and Siem Reap/ Angkor Wat. 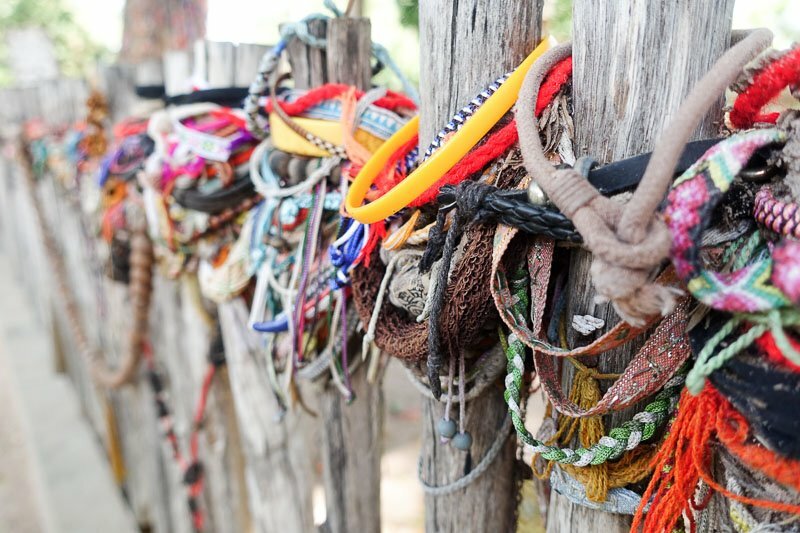 As a museum person I was particularly interested in the Narrowcasters tour of Choeung Ek (Killing Fields) and how they dealt with a site of trauma and genocide. I was absolutely sobbing at the final Stupa. My heart goes out to the Cambodian people and all the pain they have experienced but they’re great people. 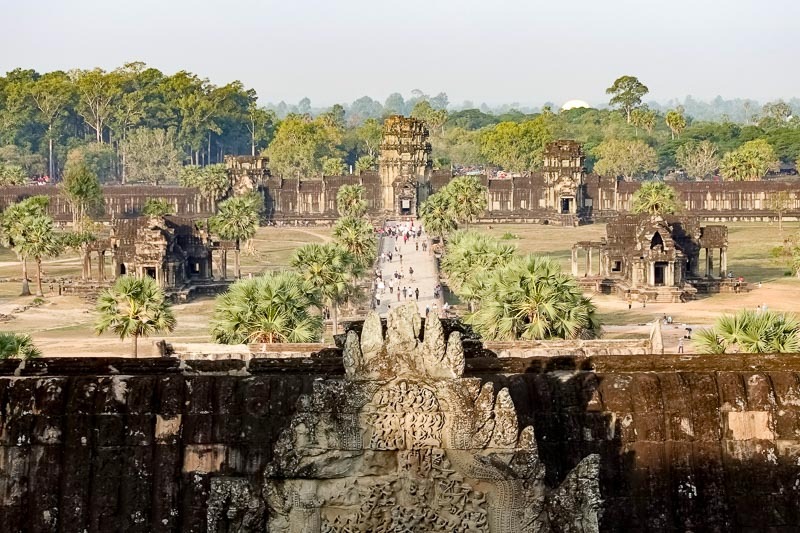 Angkor Wat is one of the most remarkable places that I’ve ever seen. I feel privileged to have travelled there. Thanks Lyndall. 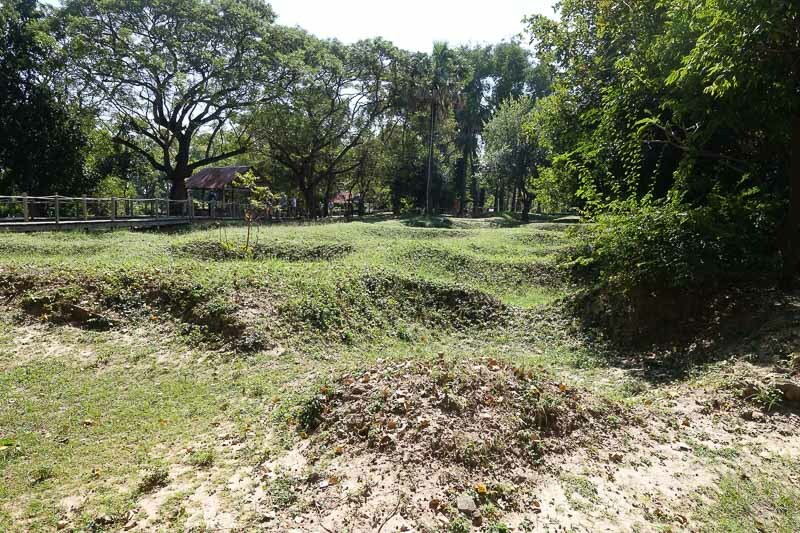 The Killing Fields don’t look like much but the horror is real – and I’m a 70’s baby, so knowing it happened in my lifetime means it hits home harder. I forgot to write that Somadevi played the movie that Angelina Jolie made “First They Killed my Father” every night in their lounge bar (Might have to add that in!). We sat there one night and watched it. Great movie, horrific story. 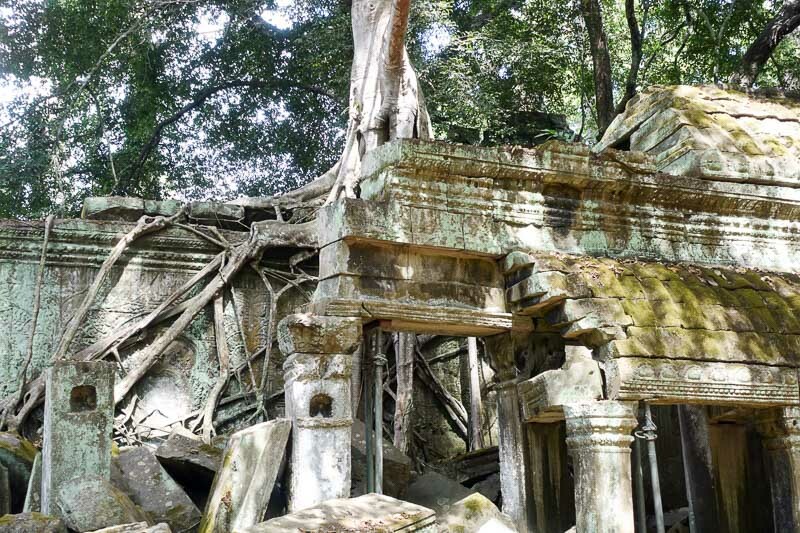 There are still very few Cambodians who haven’t been affected in some way.